Download trial version and Save 10 items from each folder. NSF to PST conversion is the most common conversion that is trending today. Seeking cost-effectiveness, data integrity, and security, businesses are moving to Microsoft platform at a fast pace. But they need a migration tool to transfer mailbox data from Lotus Notes to Outlook. Of course, Kernel for NSF to PST Converter is the favorite migration tool for many.Read More..
With the assistance of Kernel for NSF to PST Converter, you can easily convert local NSF files of Lotus Notes to a PST file. You can save the new PST file at the desired location and start using it instantly in Outlook. To migrate a large number of NSF files, you can use a CSV file (with information like the location of source NSF files, saving location, etc.). It saves you from manually selecting each file and exporting them one by one. 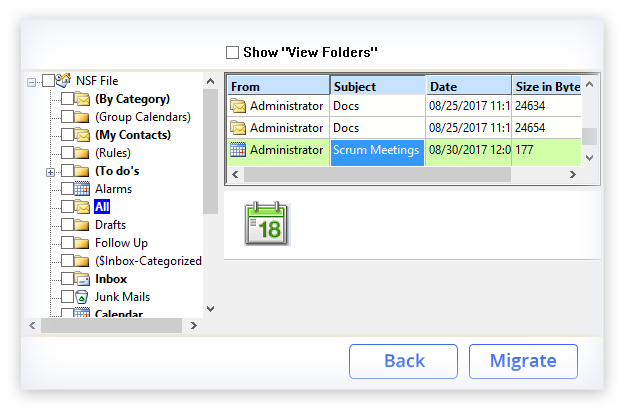 There are multiple filtering options like a date-range, select categories (emails, contacts, calendars, tasks), skip a folder named “All,” exclude desired folder, and include desired folders. All these filtering options help you to export the NSF to PST file format selectively. If the size of the NSF file is quite large, then there is a PST splitting option by which you can choose to create multiple PST files by putting a limit on the size of the PST file. The NSF file’s data integrity will be completely maintained during splitting. 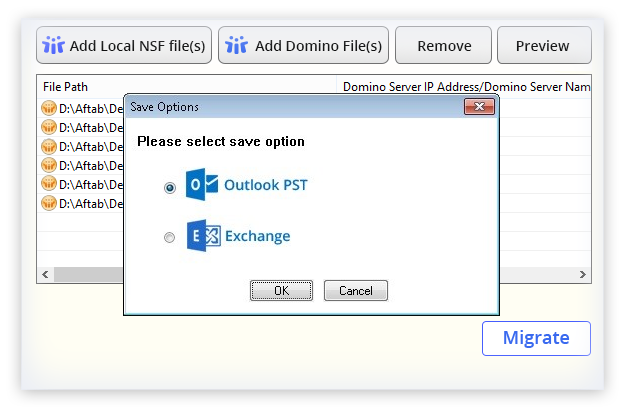 The tool also supports conversion of Domino Server NSF files to PST or Exchange Server. 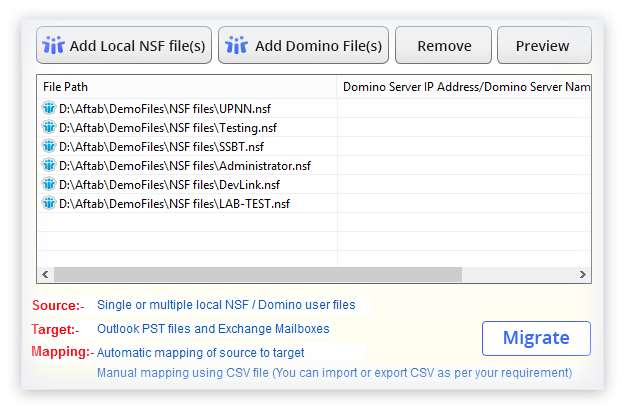 You can easily add files from Domino Server and map them to a desired Exchange Server mailbox. You can use NSF to PST Converter even with the latest version like Outlook 2019, Exchange Server 2019, IBM Notes 10. You can install the software on Windows 10 and convert NSF to PST in any condition or environment. Kernel for NSF to PST converter requires only a few steps to export NSF to PST. SelectAdd NSF files to convert them to PST format. PreviewSelect an NSF item and view its complete information. Can you explain the NSF to PST conversion in a brief manner? Launch the Software Kernel for NSF to PST converter and click the option Add Local NSF files. Browse the number of NSF files you want to migrate. After selecting the files, you can click the Preview button to view the item of NSF file. After getting a preview, you can click the Migrate button and choose between two options - Outlook PST or Exchange. If you select PST as the destination, then in the next stop you need to browse the destination folder. Next step includes all the filtering option which you can use to select the desired data to export. Select among three saving formats – RTF format (Best Quality), RTF format (low quality), and TEXT format. After completing the export process, the software will provide you with a successful message. I have selected multiple NSF files. Now how can I preview of all NSF files? There is an exclusive preview button which allows you to view any data item of NSF file. But you have to select one NSF file at a time for preview. How many NSF files can I select in a CSV file? You can select an unlimited number of NSF files in a single CSV file and export them to PST. You can download a demo CSV file from the software itself. How many emails can I export in the trial version? The trial version of the software exports 10 items per folder. To convert all the items, you should upgrade the software. If you want to experience quality service with amazing working product, switch to them. The software uses the direct approach to solve the issue and handles every kind of data with a high efficiency. I highly recommend this tool since it works smoothly and is highly secure. The idea of migration was based on quick accessibility and technical divergence features observed in Outlook platforms.